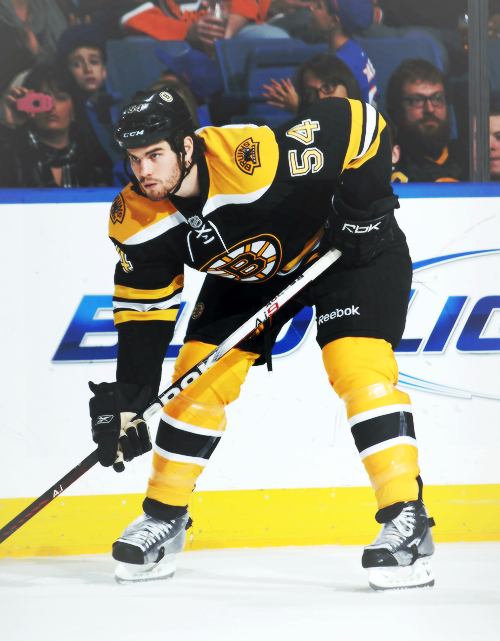 Foxy Friday: Adam McQuaid | What's Up, Ya Sieve? February 22, 2013 - Posted in Bearded and Beautiful, Chuck Loves, Foxy Friday, Like a Boss, Well OBVIOUSLY. Three things we love and post about probably more often than is normal. But we can’t help it. And when you have all three AT THE SAME TIME – well, we’re just smitten. We must honor you with our most prestigious award. This 6’5″ defencemen from Prince Edward Island might not be known to many outside of Boston but we’re out to change all that. McQuaid is perhaps most famous for his hair, a riotous accumulation of dark curls like no other. It just won’t quit. Seriously, it’s amazing. I’m obsessed with it. And apparently so is Adam. Even in mullet form, his coif is pretty spectacular, while at the same time delightfully hilarious. It takes a very special, confident man to wear this hair. His hair alone is worthy of this Foxy Friday honor. In addition to the hair, he has also got some sweet eyebrows. Look out, Zach Bogosian and Ryan Nugent-Hopkins Molly Ringwald. You’ve been put on notice. McQuaid is a classic defencemen – big, physical, and not afraid to mix it up when needed. Like when he beat down Raffi Torres. Only adding to his legend is his nickname – Darth Quaider. It might be one of the best EVER. For Star Wars nerds like us, this is just beyond perfect! If you’re ever find yourself lost in the woods with only a bag full of hockey sticks, some inner tubes, and a plank of wood, he’s a good friend to have. You might even survive. Besides all of these things, he’s just really freaking adorable. Hope you enjoyed this week’s Foxy Friday, Mr. Adam McQuaid. I know we certainly have. I might be flailing at my desk right now. I may enjoy Ebby’s face and everything about Tazer’s life but there is only jersey I wear and that’s this man’s. 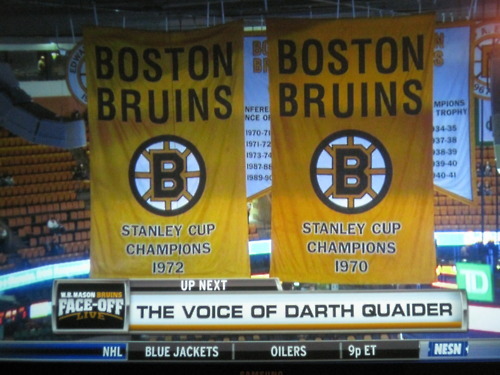 Whether it’s on the ice or off, Quaider is my favorite Bruin. I could write a novel! I am so happy to see I’m not the only one who thinks he’s foxy! But I will fight you for him. Seriously. Quaider is pretty fantastic. I’ve always liked him so I don’t know why it’s taken me this long to make him a Foxy Friday. Took you long enough woman! But kudos points on including Foxy Ference wearing his nerdy glasses! You had me at running. I am surprised you didn’t mention him being in a dragon boat race with Kate Middleton. I absolutely LOVE the photo of him in the maroon tshirt on the train. I remember when Ference posted it to Twitter when the guys were headed to NYC during the lockout. It was this photo that made me realize what I was missing. I’m now sitting shotgun on the Quaider-train! I’m having inner turmoil over this Foxy. I have, outspokenly, been opposed to this man ever since he ran at El Cap-i-tan Richards May 3, 2011 and ended up boarding himself. http://video.nhl.com/videocenter/console?id=112617 I have tried on many occasions to forgive him of his transgressions and he just does something else to piss me off. Ultimately though, I think it’s the hair. I can’t get past the hair. Lord knows with a hat on he could defile my existence but I just don’t understand how someone could intentionally walk around looking like Jagr’s love child. This is a battle of internal epic proportions. PEI thanks you for this. I don’t know what it is about this kid but I can’t stop looking at him. Pingback: Best of 2013 | What's Up, Ya Sieve?